Join us at our Hammond Brewpub for a night of HIP HOP! It'll be a packed night of non-stop music and we can't wait. There's no cover so be sure to tell your friends and we'll see you there. LoCo is a collaboration project between DJ ALO, a seasoned Chicago DJ and producer who has been a staple in the Chicago HipHop scene for decades, and CoJack, an MC from the southeast side of Chicago. They met through music years ago, rocked shows and collaborated on a few tracks together, but finally decided to combine for the LoCo album. All DJ Alo’s beats, all Cojack’s rhymes, with a fun and interesting mix of music and lyrics. The album isn’t released yet, but this will be a show previewing a lot of the new project. The Dread was formed in 2012, originally under the name The Grateful Dread. The original line-up included Billa Camp & Shelly Johnson, guest starring Nolan Silas, former guitarist of ManDroid & Jahmal Cole, Community Activist. In mid 2014, Nolan officially joined the band, along with William Silas, former front-man of Mandroid & Dj Alo of Garden Music. 5-member Artist Collective spanning Indiana, Illinois & Arizona | Embodiment rooted in the core of urban culture & the fundamentals of Hip Hop. 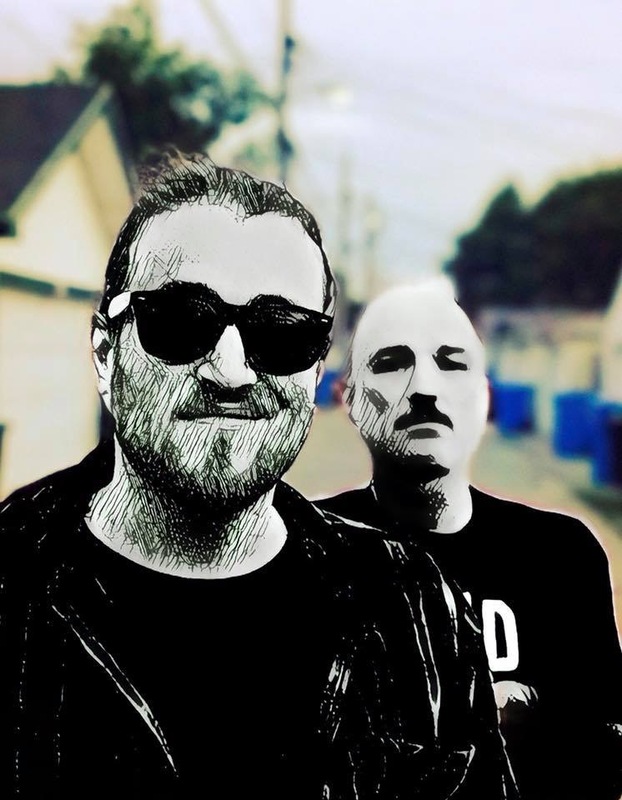 Hailing from Chicago and Aurora, Illinois; the hip hop duo, Highest Low integrates their high energy, catchy and captivating lyrics with infectious beats. Highest Low members, Just Wise and Cruz Ocho, describe their music as golden era hip hop influenced with a modern feel. "...in this world, nothing can be said to be certain, except Death & Taxes." Death & Taxes Day is an outdoor beer release and tasting festival, featuring 40+ Indiana-proud breweries, select wineries, live music and local food trucks. Join us for a day full of sampling the finest beers, wines and ciders from around Indiana! Taxman Brewing Co. will release a special beer for the event, Evasion (formerly known as Death & Taxes). Evasion is a rich, roasted and robust Belgian-style stout aged with Indonesian vanilla beans and rested several months on Kentucky-whiskey barrels. Gather your squad and decide whether you will align with the Imperial Forces or pray for a miracle with the Rebels, and then leave the other teams in your dust as you take home the top prize! Scott with Baig of Tricks Entertainment will be quizzing your teams over all the Star Wars films, while 18th Street Brewery takes care of you with delicious food and drinks to keep you energized! Spots are limited and we expect the reserved tables to go very quickly for this event. Registration will open online and details will be posted on the Facebook event page one week before the event on Tuesday, April 23rd - so be sure to RSVP to be notified of all updates and info! Join us as we welcome The Resonators to the Hammond Brewpub for a night of Country Rock & Roll! Music starts at 8 PM and there's no cover. 18th Street Brewery and 'Car Con Carne' Podcast cordially invite you to 'A Night In Hell'! Chef Mike has whipped up 5 levels of wing sauces that are guaranteed to push your taste buds to their limits. Buffalo, Jalapeño, Habanero, Ghost Pepper, and The Devil’s Blood Hot Sauce. Lost Years, Still Alive and Blood People will be rocking The Brewpub starting at 6 PM, so come hungry and ready to some amazing live music! James VanOsdol and The 'Car Con Carne' Podcast will be in the house as well interviewing Chef Mike and the bands throughout the night. There's no cover so grab your friends and we'll see you there! Join us for a night of PUNK ROCK as we welcome back Lights Over Bridgeport, Turnspit and Blind Adam and The Federal League to our Hammond Brewpub! This is guaranteed to be a night filled with music that's sure to make your parents angry. Tunes start at 8 PM and there's no cover so bring all your friends! Celebrating the 10th Annual Crown Beer Fest on June 15, 2019. VIP tickets include: Entry 1 hour before general admission, Unlimited samples of beer, souvenir drawstring bag, souvenir pint glass, and a meal ticket 1:30pm-6pm. VIP tickets are limited! Collective Arts Brewing Presents the 2nd Annual Liquid Art Festival. 50+ Brewers. 2 Days. 3 Sessions. Live Art. Live Music. The Liquid Art Fest is back! Celebrate international beer, art, and music at the Collective Arts Brewery on June 14 & 15, 2019. Featuring live mural artists and live music, art galleries, screen printing, food trucks, and of course over 50 of our favourite brewer friends from around the world. Each brewery will be bringing and pouring their most unique and rare beers. This is a 19+ event. The Liquid Art Festival will be ‘all-inclusive’ this year! This means no more worrying about change, lost or unused tokens, and no waiting in token lines. You arrive, receive a glass, and start sampling stress free. Your ticket will provide you with open access to all the beers at the festival. We encourage everyone to enjoy all of the delicious brews responsibly, and note that all of our pourers are smart serve certified and will not serve you if you are intoxicated. There will be Designated Driver tickets available! General Admission (GA) tickets include entry to the festival and a sample glass (5 oz). Each session will showcase different brews from over 50 international breweries. There will be cider too for all our gluten free friends. The brewery lineup will be announced ongoing until June, and the beer list will be announced the week before. Live mural artists will paint over 2000 sq ft of our brewery walls while the crowd below watches. Artists will be announced in 2019. 18th Street Brewery and Franklin House are throwing an old-fashioned Burger Battle! Chef Mike and Chef Erik will each prepare their most delicious burger for you to enjoy. Judges from Sovereign, BuckleDown Brewing and Ricochet Tacos will be here to say which burger reigns supreme! There will also be live music starting at 8 PM, so you don't wanna miss out on this one! Join Mikkeller Running Club:18th Street Brewery Chapter for our 2nd run! We are so excited to bring our love of good times, running and beer together in one place. This 5K run will take place on Hammond's own Monon Trail. All skill levels are welcome! Run starts at 12:30 PM at our Hammond Brewpub with delicious 18th Street Brewery beers to follow afterwards of course. We’re thrilled to be pouring at Pastrytown with Other Half Brewing on March 16. Join us in Brooklyn and experience craft beers from 36 artisanal brewers worldwide. Limited VIP and general admission tickets are on sale now! We are getting a truck load of beers from 18th Street Brewery and The Sour Note Brewing! This should save you that trip to Hammond, IN! The Chicago Beer Festival will take place at the Field Museum for a one of a kind experience -- a night at the museum! The event will feature dozens of local and domestic breweries, sampling their spring seasonal beers. General admission will be 8pm to 11pm and VIP admission will be 7pm to 11pm (in addition to the added hour, VIP admission will include specialty beers poured for the VIP session) Tickets are sold out so we hope you got yours early! Join 18th Street Brewery and 150 breweries and thousands of beer lovers from around the world in celebrating the 10th Anniversary of Hunahpu’s Day® in Tampa, Florida. Centered around the annual release of Hunahpu’s® Imperial Stout, Hunahpu’s Day® offers beer lovers the opportunity to taste some of the world’s rarest and most sought-after beers in unlimited 2 ounce pours while rubbing elbows with the brewers themselves. Entrance to Hunahpu’s Day® also grants you bottles of Cigar City Brewing’s extraordinary Hunahpu’s® Imperial Stout, a massive Imperial Stout with Chile Peppers, Cinnamon, Vanilla and Cacao Nibs that’s released only once a year and never hits store shelves. Come hang out for some great food and great beer when 18th Street Brewery takes over Station 21 Bar and Grill Taps! Join us at Sovereign for an 18th Street Brewery Tap Takeover! 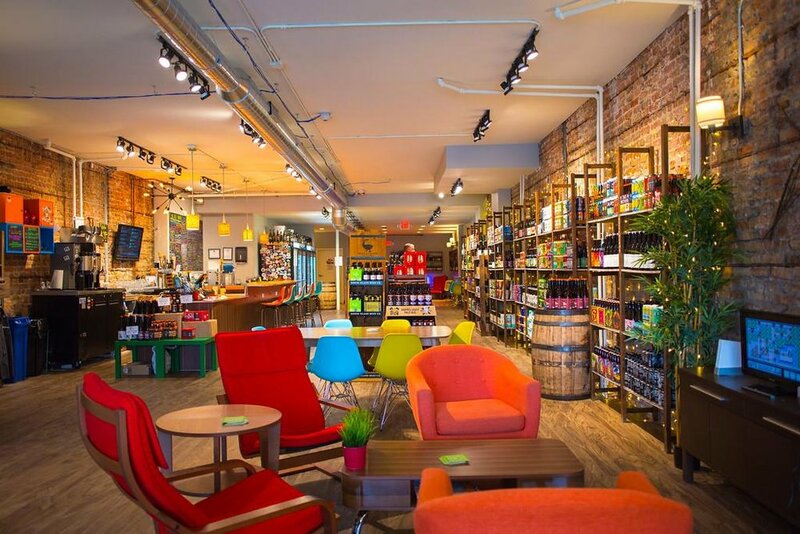 We'll also be featuring 3 specialty cocktails made using 18th Street Distillery spirits! What is Tony's Stark's computerized help system in Iron Man called? What is the name of Hank Pym’s daughter, played by Evangeline Lilly, in Ant-Man? If you know these answers (and more), celebrate the impending release of Captain Marvel and Avengers: Endgame by coming out to Marvel TV & Film Trivia Night at 18th Street Brewing! Scott with Baig of Tricks Entertainment will be quizzing your teams over the entire universe of Marvel TV shows and films, while 18th Street Brewery takes care of you with delicious food and drinks to keep you energized! Spots are limited and we expect the reserved tables to go very quickly for this event. Registration will open online and details will be posted here in this event on Tuesday, February 19th - so be sure to RSVP to be notified of all updates and info! Join us as we put on one of our world famous Tap Takeovers at Bugaboo’s Bar and Grill in Cedar Lake! Starts at 5 PM and will go all night long! Join us for a night of a terrific roots music by the amazingly talented Gerry Hundt Music! Music starts at 8 PM and there's no cover so be sure to grab your friends and come enjoy some awesome live music and delicious 18th Street Brewery beers. "Gerry Hundt has become a staple of acoustic excellence at Legends. His incredible guitar licks and unique style of mandolin play (among his numerous other instruments) have garnered him a strong reputation among his peers and fans." 2/16 marks the triumphant return of the Carnival of Caffeination! The worlds of two equally glorious beverages collide in this celebration of all that is coffee & beer. Prepare for a magical day of both caffeinated & fermented masterpieces from the some of the most boss-level brewers & roasters on the planet. 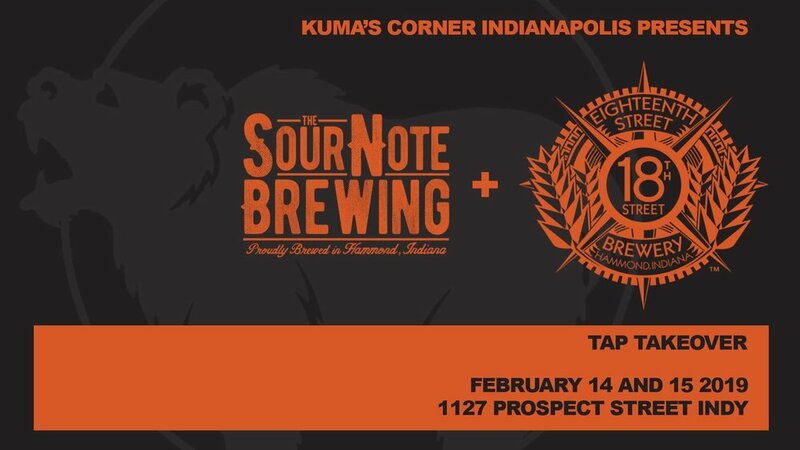 We’re headed down to the 317 for a full blown 18th Street Brewery & The Sour Note Brewing Tap Takeover weekend! There will also be some specialty craft cocktails featuring 18th Street Distillery spirits as well! Full tap list will be available soon! Join us at Franklin House in Valparaiso on Feb. 1st for an epic TAP TAKEOVER! We'll also be releasing our collaboration IPA during this event too, so you don't want to miss out on all the tasty brews. There will also be a delicious specialty burger only available that night, so arrive early and arrive hungry! Did we mention there would be live music starting at 10 PM too?!? !